Once you have created your Check Boxes question, you can now add, as well as modify, delete and re-order the answer choices associated with it. Your question will then appear in the bottom portion of the page in the Add/Modify a Question section. 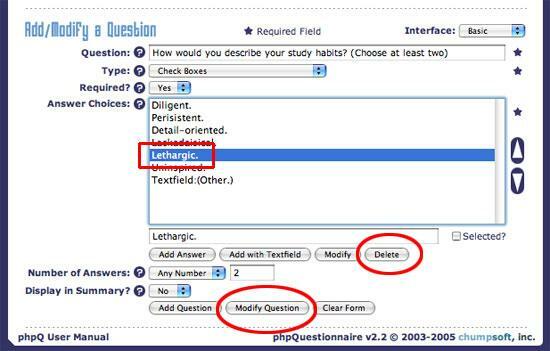 From here, you can add, modify, delete, or change the order of your questions’ answers. 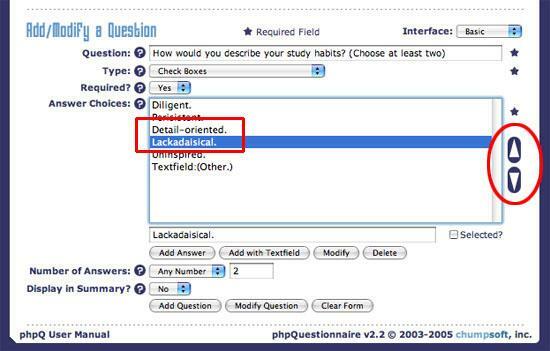 When adding an answer, you will have the option of making it a pre-selected choice for the user taking the survey. This option appears a checkbox next to the word Selected? (To the bottom right in the above image). 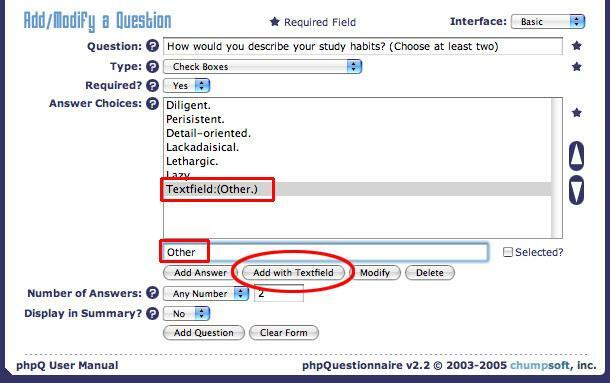 If you check that field, the answer will already be selected or checked when the user takes the survey. 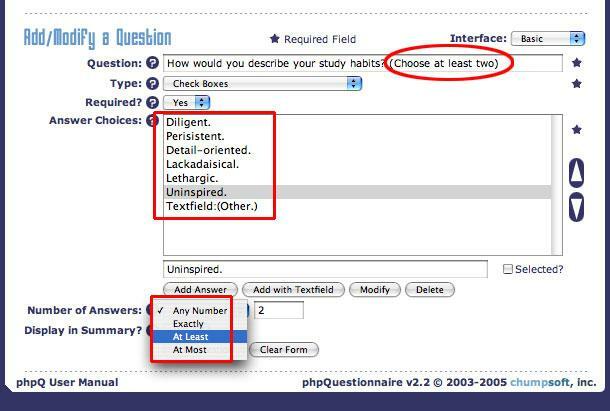 In this way, you can provide default answers or choose which answer you wish to have selected by default. When you have finished typing your answer in the text field, click the Add Answer button. If you wish to have a text input field associated with the answer choice you are adding, you can add an answer with a text field. You will then receive a notification that your question has been successfully modified. 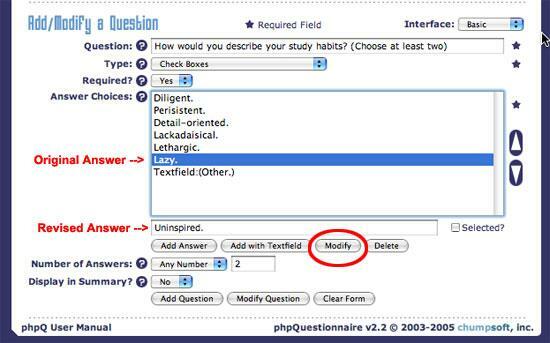 Upon clicking the Modify button, your revised answer will then appear in the Answer Choices box. To delete one of your answer choices, simply click on the answer choice that needs to be modified in the Answer Choices box. 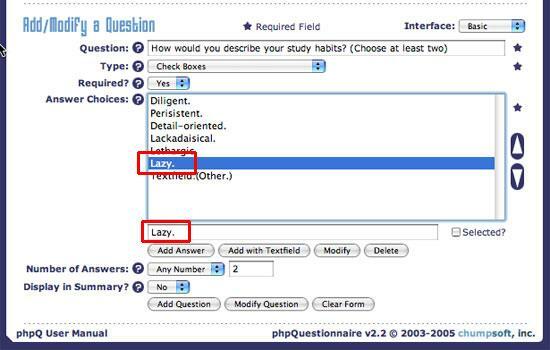 Upon clicking on it, it will appear in the text field beneath the Answer Choices box. Then, click on the Delete button beneath the text field. 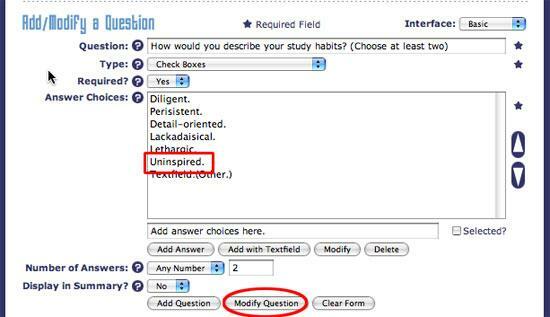 Click the Modify Question to save your answer deletion. You can change the order in which the answers will appear. First, click on the answer you wish to move in the Answer Choices box. Then, click on the arrow (in the right hand portion of the image below) pointing in the direction you wish to move the answer. For this example, we will move the highlighted answer up. 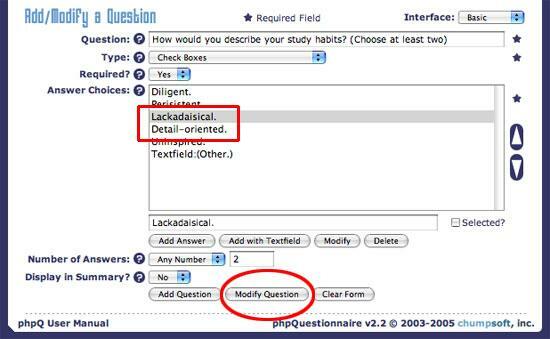 When you are satisfied with the question order, click the Modify Question button.